Psst, I got a Gocco machine. OMG! 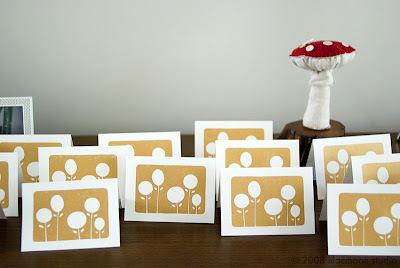 I first learned about Gocco a couple years ago when I was browsing various sites of Jill Bliss. I was immediately drawn to it but resisted getting one because I read that they were going to stop making them. But recently, I started to seriously reconsider because of my recent interest in rubber stamping. If I like making duplicates, then why, I should get into screen printing, I thought. And then one day, this Gocco came in the mail as a surprise present! >_< Thank you.. you know who you are. I am one happy gal. 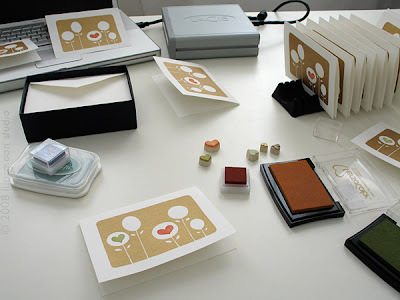 Those cards in the picture above are the results of my first Gocco printing. As you can see, I made some mistakes and tested on different colors of paper. I think I used up almost half of the gold tube! What was I thinking? Heh. I guess I could have made a second screen for the hearts or used the blocking strips but I didn't want my first Gocco project to be too challenging. 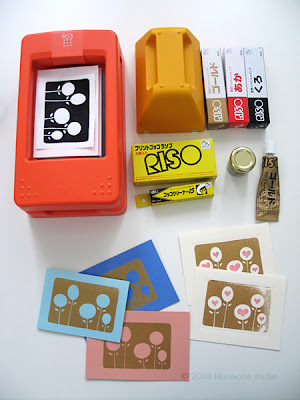 I rather like this combination of Gocco + rubber stamping. Lucky you receiving a Gocco. Your first prints are so cute. I like how you used the rubber stamp for added detail. this is so lovely! i will do a duo-project together next time i'm out there! Nice. Those cards are great looking! c'est tellement bien ces cartes.